When high a high school teacher, Grace Wesley, is asked an honest question in her classroom about Jesus Christ, her forthright answer lands her in very deep trouble. She didn’t think twice about informing the student that Jesus is real, He existed in time and space, and God is not dead, despite what the most people say. Peter Kane’s truly believes that he is going to prove that God is dead, once and for all, and even says “I hate what people like your client stand for” but the truth is, God does exist and nobody on earth can positively prove that He doesn’t. This statement came from Tom Endler, Grace Wesley’s attorney, didn’t agree with her doing what she did by professing Jesus Christ’s historical authenticity. When Grace Wesley’s attorney spoke with her, he wanted to be upfront about her situation and told her that she’s in big trouble because she was passionate about what she believed. Grace didn’t even blink an eye when her attorney told her that because she knew that she had to stand up for what she believed in and Jesus Christ was worth going through a trial for, even if it was a literal trial. Teacher Grace Wesley is openly and publically proclaiming Jesus Christ, even at the risk of losing her job. It reminds me of Jesus’ statement, “whoever denies me before men, I also will deny before my Father who is in heaven” (Matt 10:33) and Grace would be one of the last ones to ever deny Him. Perhaps Jesus’ words in Scripture were still echoing in her mind where Christ said, “whoever is ashamed of me and of my words in this adulterous and sinful generation, of him will the Son of Man also be ashamed when he comes in the glory of his Father with the holy angels’ (Mark 8:38). This courageous woman of faith didn’t try to rationalize her not being able to give an answer to a question that she was asked by denying Jesus publically and before her students the history class that she taught. What about you and what about me? Would we deny Him even if most of those around us would? Grace’s attorney, Tom Endler, sees that it’s more that Grace Wesley who is on trial. He insists that the Christian faith is on trial and all around the world, it is. Some deny Jesus Christ publically but many others would never do so, even if it means losing their life and many did and many still do today. Our faith is on trial in the public square, in the schools, in the governments, and all around the world. Reverend Dave knows what’s really going on here…it is a war against Christ and the Christian faith. He fully understands the implications and the ramifications of this trial, seeing it as a spiritual war by an invisible enemy who holds sway in much of the ways of the world (2nd Cor: 3-4). This man realized that “we do not wrestle against flesh and blood, but against the rulers, against the authorities, against the cosmic powers over this present darkness, against the spiritual forces of evil in the heavenly places” (Eph 6:12). The prosecuting attorney, Pete Kane boldly claims that if they’re looking to prove that Jesus Christ actually existed then they’re trying to prove a ridiculous claim but interesting, more historians (even non-Christian ones) have written about Jesus Christ than any other single man in human history. If Jesus Christ didn’t exist, why was He the Man who was written about more than any other? It seems strange that so many historians would write about someone who they believed never existed. What a powerful line this is that was spoken by teacher Grace Wesley. She is exactly right. If Christians today are afraid of the world and being judged by them they are going to fear someday that they will be judged by God. She would rather take her chances and be judged by God and ignore the world’s judgment than ignore the judgement of God. The old phrase that if we don’t stand for something, we’ll fall for anything is certainly true in the case for standing up for our faith. Today, many Christians would rather keep their mouth shut than incur the wrath of unbelievers who are busily stripping our rights to exercise our faith. Their true intent is to wipe from the face of the earth every vestige of Christianity, including Christians. This spiritual warfare is only going to get worse and worse as the time leading up to Christ’s return approaches. 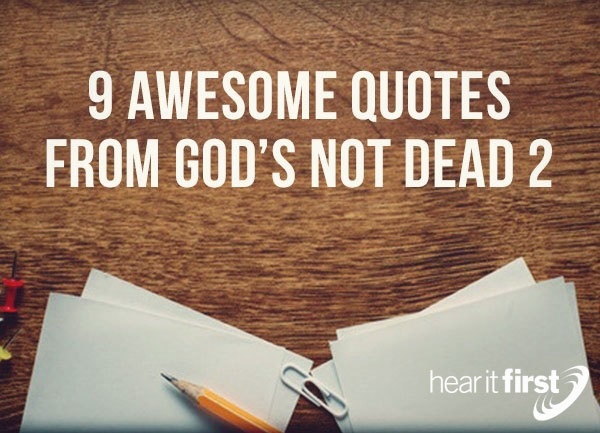 When Grace Wesley, a high school teacher and devout Christian was asked a question about Jesus Christ in her classroom, she was unafraid and bold in proclaiming the name of Jesus Christ and even quoted Scripture but that’s when everything blew up for her. Even though she risked losing her job and even her teaching certificate, she was not going to back down. The school wanted to make an example of this young woman in a public trial but she was not ever going to deny God, knowing that God’s not dead…He is alive, now and evermore.